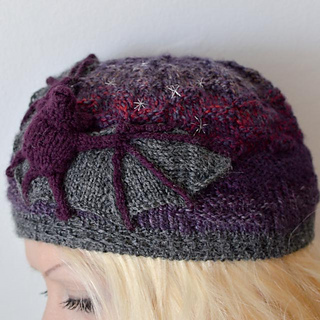 A beanie in three sizes featuring night-time sky of knit-purl textured patterns, with bats flying by. The beanie is knitted in the round, and the bats are knitted separately and sewn onto the hat. Choose a dark yarn for the night-time sky, or a colorway that mirrors the colors of sunset or the dawn sky. Add some stars and a bat (or two) for a quite unique hat! There are front and back view bat patterns included. An intermediate knitter should be fine with this pattern, although there are a few techniques you may not be familiar with for the bat. There is a photo tutorial included for these steps, and should you have questions you can always contact me.